Our delivery system binds superior nutrition with probiotic powerhouse GanedenBC30 getting it to your digestive tract where it’s absorbed quickly and completely. Our Absorb More Take Less Technology means you get the support your body needs, and the results you deserve at a price that makes sense. Welcome to the Fast Track. Fast Whey Protein provides your body with a rich source of naturally occurring branched chain amino acids (the building blocks for protein) and lipids (fats) that your body can readily absorb. Recreational and professional athletes alike know protein is essential to the body. During and after exercise, amino acids are in high demand to fight fatigue and to support muscle repair and recovery. Fast Whey provides 17 grams of quality protein in addition to 600mg of Taurine, an antioxidant functioning amino acid known to improve neuromotor and neuromuscular development. 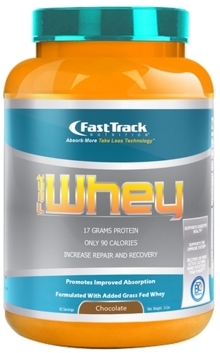 Fast Whey mixes easily, tastes amazing and will put you on the Fast Track to achieving your desired results. ADDED BENEFITS: Stacks well with Pro BCAA, Pro Creatine and Pro Glutamine.